I am pleased to be able to welcome Joe Hickey, author of Secret Seekers Society and the Beast of Bladenboro to Obsession with Books. 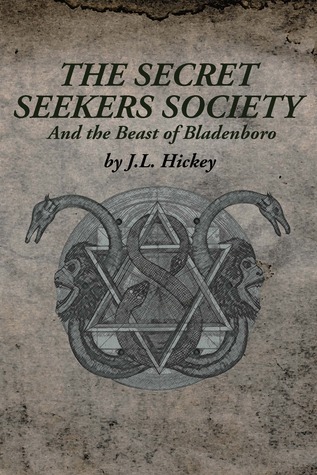 Book Synopsis: Secret Seekers Society and the Beast of Bladenboro follows the young protagonists Hunter Glenn, and Eliza Lynn through an adventure ripe with adversity, paranormal monsters, secret societies, and most haunting of all, a life without their parents. The book follows the siblings as they are dropped off at their new guardian’s home, an ancient and creepy mansion known only as the Belmonte Estate. Here they unravel the secrets of their parent’s true identities, the origin of the mysterious Mansion, and their inheritance into an ancient secret society of monster hunters known as Seekers. INTERVIEW: Welcome to Obsession with Books Joe, Are you able to tell us a little about your book Secret Seekers Society and the Beast of Bladenboro and yourself? Sure, and first off, thank you kindly for this opportunity! Secret Seekers Society is a book that was originally written as a short novella for my niece and nephew as a Christmas present. When I released my first book in 2008, my sister made me promise one day to have her kids star in a novel I wrote. Originally, this was going to be a book to share only with my family. However, once I began crafting the narrative, the story itself just started growing into a bigger project. At one point, I realized I was creating something much more than a novella, and scrapped the original story and began fleshing out more of a background about the eerie Belmonte Estate. I realized I had something special, something I wanted to share with the world. Thus, the series was born! A little bit about me? Well, I have been a writer my entire life. I have always had a creative mind, and went through great lengths to find my creative release. It wasn’t until late in my college years that I realized it was something I was fairly good at. I was struggling to find myself, and one winter semester I decided I would take a creative writing course for fun, and after I read my first story out loud in class I knew I was onto something. Later that night, I had multiple classmates pull me aside to tell me how wonderful and creative my story was, and how they wished they could do the same. I suppose, it inspired them a bit. That’s one of my key reasoning’s in putting so much work into my dream. Outside of writing, you will find that I am your typical average high-end nerd. I love any fantasy/paranormal, table top rpgs (fiasco the game is amazing for any authors out there!) and even head up my own paranormal investigation group, MIParanormal. I cannot remember not writing, ever. I mean, I began writing novels in 2002 taking six years to finish my first. But I remember writing my own “illustrated” children’s book when I was in grade school. A tantalizing tale filled with my best friends, treasure, a pyramid, and a stereotypical mummy protecting its fortunes. “Why” is a tricky question. I adore the ability to create. To bring life to the nonexistent through my pad and pen, to manipulate worlds and develop such fleshed out characters that people grow to love/hate them. How empowering is that? The ability to emotionally grip your audience through your own words, to bring tears to their eyes over the struggles of a character you breathed life into? It’s exhilarating! With the right words, one can motivate, inspire, educate, and move an entire audience. A locked door, my computer, and a brewing cup of coffee. Oh yea, and absolutely no distraction! I delve into the fantasy realms of fiction. So research is little to none. I have written historical fiction and it can take months, if not longer to get facts right. To be honest; Secret Seekers Society does a tad bit of that. Most people do not realize The Beast of Bladenboro is not completely fictitious, it is a real crypto. I have studied cryptozoology for years now, so the research comes more naturally to me. My writing process is pretty simple. I sit, I write, and I follow wherever the story takes me. I enjoy not knowing what’s going to happen next, keeps me on my creative toes, so to speak. For me, I like the flesh itself out, I merely transcribe it. It’s almost like watching a movie to me. I find I cannot over structure, or analyze. When I do, I tend on having to back track a lot and rewrite to fit everything in. Basically I have a very thin plotline, and certain key points, the rest is improve. Of course, then I edit for high end concerns and flesh out whatever may be needed. I read one chapter of Harry Potter when I get writers block. I am good for the rest of the day. Something about that book that just gets my mind flowing with creativity. If were to be made into a movie, who would you chose to play the roles of your main characters? Hunter and Elly are so young, they would have to be some up and coming no name actors. I am not too big on famous 12 years olds. As for the main antagonist, I envision John Pyper-Ferguson (from Alphas) to play Professor Aten. I am currently running a kickstarter campaign to fund my next project called Wergild. A thought provoking and complex avent-garde fantasy novella, that delves deeply into the meta-fictional aspects of creator and creation. After the success of my first kickstarter campaign (I raised $1200, to fund Secret Seekers Society) I thought it would be a great idea to fund another. Outside of that, I have been dedicating 30 hours a week to self promotion, on top of my 50 hour a week retail job, so I keep myself busy. Work starts soon on Secret Seekers Society and Solomon’s Seal, the second book in the forthcoming Seekers series. Fave band / television series / movie? Red Hot Chilli Peppers. Lost. Watchmen. Cats or Dogs? Great Danes! I have two of them, both make cameo’s in Secret Seekers Society! Author Bio: I'm Joe. I have dedicated my life to writing. I have studied and attained my Creative Writing degree at Saginaw Valley State University. I tend to dable in Y.A. Fantasy. I have written and self published my first novel over three years ago. I have just released my second novel the Secret Seekers Society and the Beast of Bladenboro on 12/31/12 after a very successful kickstarter campaign raised enough money to fund its editing/formatting/and book design. I also dabble in Literary Fiction/Fantasy and shorts. Thank-you so much for taking time to talk to us today! Thank you again for the chance to share my book with your blog! 5.0 on barnes and nobles! perhaps that may gain some interest! This was new to me, so thanks for sharing and I love that Potter helps writer's block!